"I want to marry you so I can date you for the rest of your life." Those are the words Larry spoke to Gwen right before he got down on one knee. It has been an honor being part of this beautiful love story. We wish Larry and Gwen much happiness and many wonderful dates in their future together as husband and wife! Congratulations to Nathan and Kay! 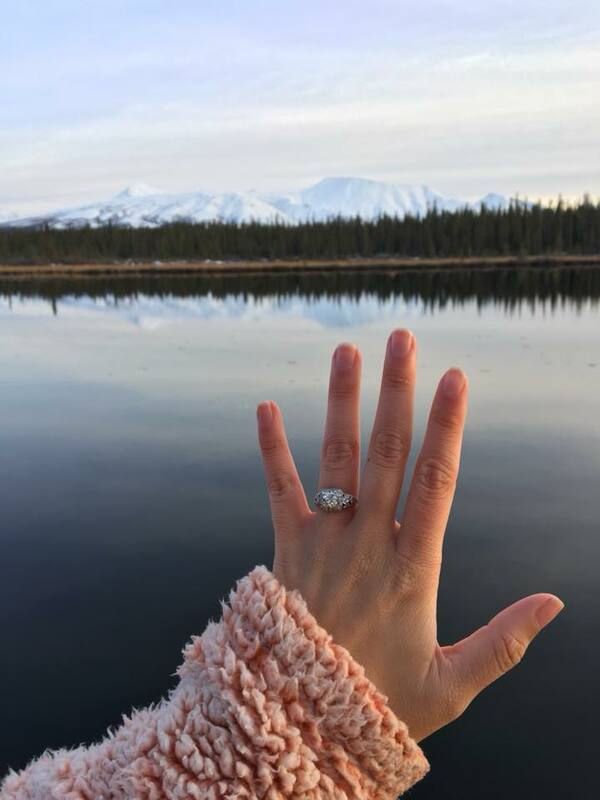 The happy couple recently went on an Alaskan adventure, where Kay received the surprise of a lifetime! We wish you both much happiness in your future together and many, many more adventures to come! "Much to my surprise, Nathan proposed on a trip we recently took to Alaska. We have dated eight years, so I was somewhat anticipating an engagement. He is such a planner and farm boy that I was sure he would propose on his farm. I was in complete shock when he dropped to one knee spontaneously on vacation. I booked our reservations at Tonglen Lake Lodge which is located right outside of Denali National Park. We arrived at sunset to a beautiful lodge that sits on Tonglen Lake surrounded by towering snow-capped mountains of the Alaska Range. Nathan walked to the end of the dock, and I snapped a few pictures with the breathtaking view behind him. He then walked toward me, dropping to one knee, asking me to be his wife. When he opened his hand, I saw the most beautiful Art Deco Old European cut diamond antique ring." The most perfect elopement! We just adore these two! Congratulations to Matthew and Rachel! Congratulations to Tutt and Clarissa! You must take a moment to read through their love story, as told by Clarissa below. There are so many Franklin connections that it makes our hearts flutter! The last little bit of the story (read to the end! ), means so much to us, and is one of the many reasons why we love what we do and the people we meet along the way. "Tutt and I were formally introduced at the 1st annual Pilgrimage Festival through mutual friends during the very last concert on Sunday, September 27th, 2015. (Willie Nelson). Needless to say we were both were hooked at first sight! Tutt and I both grew up in Franklin, TN, attended Battle Ground Academy and, after many separate paths and travels had moved back to the area. After realizing this was the man of my dreams, Iwas struck one day by a Walton post of my now wedding ring. I snuck into Walton's on a whim after seeing the ring that I could not get out of my head. This ring reminded me of my mother's full wedding set, yet had its own very unique and everlasting twist. I have never been a girl who knew what type of ring I wanted when I was married, but upon first sight of this ring, just like first meeting Tutt, I just knew it was meant to be forever. I visited Walton's twice on my own (first time would not even touch the ring......but it lured me back and I knew it was the one). My best friend hinted to Tutt about my secret adventure (without my knowledge) and Tutt went to Walton's twice as well, the first time on his own to look, the second, accompanied by his wonderful mother, to purchase the special ring. Tutt proposed on the Friday of the Masters Golf Tournament at Augusta National on April 8, 2016 on the 4th hole ("Flowering Crabapple"), which is my absolute favorite hole in golf and one of my favorite places in the world. He patiently waited until all golfers had played the hole for the day and we were the only ones left in that area. He got down on one knee and I am pretty sure I said Yes before he could finish his perfect speech. Tutt and I were married on April 1, 2017 in Pawley's Island, South Carolina at the Heritage Club in a gorgeous outdoor setting on the creekside of the island. We spent a week celebrating with close friends and family. The wedding was absolute perfection and will be a day we reminisce about for years to come. Our wedding date was exactly one year to the day that Tutt purchased the ring! We were lucky enough to return to the Masters gold tournament the week after our wedding and returned to Hole 4, the place of our engagement, this time as husband and wife. Although photos are not allowed to be taken on the Augusta National golf course, we did get one photo at their visiting site. Here are a few photos of our wedding ceremony and of course, the exquisite and most special piece of jewelry in my life.....the Walton's ring. As a very special side note, another piece of jewelry I wore at my wedding was my "borrowed" item from one of my cousins. My cousin was given this piece of jewelry (an antique gold clasp bracelet lined with gorgeous emerald shaped amethyst) by my late grandfather, in honor of my grandmother, at her own wedding. This bracelet was one of my late Grandmother's absolute favorite pieces of jewelry, which she had purchased years ago on a trip to visit us in Franklin......she purchased this precious piece at no other then Walton's. I cannot begin to describe the emotional feeling of having this bracelet on during my special day.....she was truly right beside me through this piece." "We lived in Nashville for only a year. Jenn's job had brought us there, as well as other places across the county. She was getting a job promotion and moving us to Montana. While she was in Texas for training, her mother was in Nashville helping us pack. While her mother and I were out walking the dog, I asked her if she would like to pick out an engagement ring for Jenn. She was so happy that I was going to ask her to marry me. We went to a few stores, but really didn't know what I wanted. She is a one of a kind girl and I didn't want a massed produced ring. I came across Walton's online and decide to take a look. We headed there on a day you were closed, I think it was a Monday. Through the window, we knew we wanted to come back. Came back the next day and within 10 minutes we were walking out with the ring. I proposed on the road trip from Nashville to Montana at our family's cabin. I first threw her a ring pop and said I bought her a ring. After she laughed at me I got down on a knee with the Walton's ring. She never said yes. She said, "Of course". We got married in October in Colorado. It has been a great start to a great marriage. She get compliments on the ring nonstop. Thank you Walton's." We wish you both much happiness together and look forward to seeing you on your next trip to Nashville! Congratulations to Timothy and Aidan! The pair came by searching for the perfect ring and found this gorgeous Edwardian era Old Mine cut diamond cluster! We wish you both a lifetime of happiness together! Congratulations to Joe and Autumn! Autumn is a stylist at Dion's South Salon on Main Street and just so happens to style a few of us Walton's ladies' hair! We've gotten to know Joe through the engagement ring process and we more than approve! Nothing makes our hearts flutter more than something beautiful and old (I mean, we are in the antique jewelry business after all!). Our hearts skipped a beat when Courtney sent us pictures of her and Nick's wedding day! The two got married in Courtney's hometown of Sharonville, OH. Her 1920's engagement ring paired perfectly with her wedding dress, the same dress that her mom wore in 1961!! Congratulations to Courtney and Nick!!! Congratulations to Mitchell and Candice! We first met the couple when they came to Walton's together looking for an engagement ring. They found the perfect one and before we knew it, Mitchell was down on one knee proposing to Candice in our showroom! It was such a magical moment, that has since been followed by a stunning wedding day! We feel so humbled and blessed to have such wonderful people share their love stories with us. We wish you two a lifetime of love and happiness! We are swooning over this gorgeous shot of Rebekah's Art Deco engagement ring, photographed by K. Stoddard Photography and Fine Art! Congratulations to Chris and Rebekah! Congratulations to Philip and Laura Beth! Philip Peters and Laura Beth Stubblefield are living out a love story with miraculous twists and turns throughout the last 9 years. Their friendship turned romantic less than 9 months ago and Philip's journey in dating Laura Beth includes a supernatural appearance of an empty ring box that appeared in his luggage after a return flight from Haiti!! Here's the ring he filled the empty box with, a 1920's stunner from Walton's! We wish you both a life of many happy and loving adventures together as husband and wife! Longtime customer and friend, Crispin Menefee, recently wed John Menefee, a wedding in which Walton's played an interesting role; Our very own Mike Walton helped to restore her family heirloom tiara that Crispin wore on her wedding day! "The bride’s veil was made by the well-known French DesignerJean Dessés in the 1950’s. Due to the size and the intricacy of the Spanish Rosepoint lace, the mantilla would have taken anywhere from 3 to 5 years to hand make. It was hand delivered from France to the bride’s maternal grandparents Dorothy and Ernest Watkins in 1958 by their friend Charles Montegue. The bride’s mother Dorothy Watkins Davis, for her wedding to Francis Patrick Davis in 1966, wore the mantilla with its peineta (mantilla comb), which was its original Dessés design. Frank and Dorothy celebrated their 47th wedding anniversary this past September. In 1992 for their daughter Legare’s wedding to Hank Vest, Grace’s of Nashville removed the peineta leaving the mantilla to be worn with only the Dessés tiara. The veil was next worn by the Davis’s daughter Melanie at her wedding to John Van, in 2001 at Bear & Fox Farm. In September 2013, when the veil was brought out one more time in preparation for Crispin and John’s wedding, the yellowing of the fine fabric showed that time was taking its toll. We deeply thank Mrs. Erin Vaughan of Spring Hill, Tennessee for her work on this veil. Using her passion and knowledge of antique lace restoration, she spent a full week gently cleaning the mantilla by hand, section by section, using a gentle solution which has safely returned the veil to its original color. We also thank our dear friend Federica Grimaldi for introducing us to Mrs. Vaughan. To complete the team of individuals who worked together to bring the veil and its tiara back to life, we extend our sincerest gratitude to Mike Walton at Walton's Antique and Estate Jewelry for his personal help in cleaning and repairing the antique Dessés tiara." Mr. and Mrs. John Menefee. We love happily ever-afters! And we love when our Walton's couples share pictures from their special day with us! We are very fortunate to work with wonderful customers and are honored to be a part of their lives together. To give a couple a literal representation of the love and unity they share as husband and wife is a truly beautiful thing! Congratulations to the happy couple! Her antique diamond ring and diamond band from Walton's.